T-Tapp! More Than a Workout! It’s The Incredible Fat Burning, Inch Loss System! Sick and tired of going to the gym or walking for miles a day and not seeing any visible results? Sure you feel a little better. You are proud of yourself for actually getting out there and working it. But does it seem like no matter what you do, you just can’t get rid of that poochy belly, bat-wing granny arms and side saddles on your legs? If so...you are not alone! Enter the world of T-Tapp! What the heck is this workout with the crazy name? Its’ NOT tap dancing!!!! There is no dancing at all. So if you aren’t coordinated, you are in luck! You can do this workout. The biggest problem I’ve had with T-Tapp is trying to explain what it is. Words really don’t tell you anything. They make the workout sound like some medical procedure to be endured instead of a workout that makes you look and feel fantastic. Here’s what I can tell you. .. 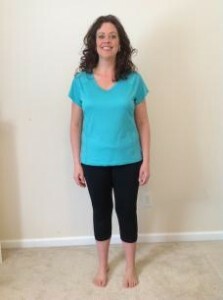 If you want to burn fat fast, lose a ton of inches fast, flatten your poochy tummy, tighten up those bat-wing underarms and get rid of the side saddles on your legs, T-Tapp is for you. I know because I’ve been a T-Tapp Trainer for over 17 years and I’ve seen it happen for hundreds of women I’ve worked with. Not only that, but it works it’s magic FAST!!! I’ve seen women lose 2 clothing sizes in 4 weeks! Did I happen to mention they did it with a 15 minute workout??? Yes!!! They t-tapped for 15 minutes a day consistently! But still! T-Tapp for 15 minutes a day and lose 2 clothing sizes in 4 weeks???? Talk abut burning belly fat fast. When things sound too good to be true, they usually are. At least that’s been my experience. I can understand if you don’t believe you can get these types of results. Neither did the thousands of women who have tried it. Like Charlotte Siems. 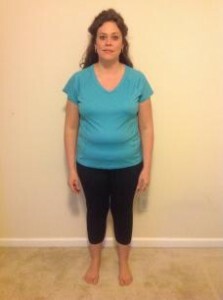 Charlotte went from a size 22W to a size 4 by t-tappping 15 minutes a day consistently. Now if you’re saying to yourself “sure but she probably doesn’t have anything else going on in her life”, think again. Charlotte has 12 children that she homeschools!!! If she was able to carve out 15 minutes in her day…you can too! T-Tapp has hundreds of testimonials that can’t be denied. Check out my Inspiration page. There are tons more on the T-Tapp site. in 60 days with T-Tapp! T-Tapp heals your body from the inside out. By improving the health of three primary systems within your body, T-Tapp heals your body and produces results naturally without the necessity of pills, high-impact cardio or traditional weight training. Through muscle strengthening and flexibility movements, T-Tapp helps to align the spine which increases neuro-kinetic flow from the brain to the spine to the extremities. This stimulates nerves to all parts of the body making organs and muscles work more efficiently and resulting in dramatically more energy. Cellulite is the result of a sluggish lymphatic system, along with brittle fascia. T-Tapp movements improve the functions of digestion, assimilation and elimination to rid the body of toxins and liquefied fat. By boosting the lymphatic system, you become healthier, lose inches quickly and feel terrific. At the same time, you are loosening the fascia (connective tissue that holds everything in place) which allows you to get out of pain and re-sculpt the body! Each T-Tapp movement uses multiple muscles at one time, and uses them at maximum capacity for greater muscle density rather than bulging muscle mass. In addition, T-Tapp workouts raise the heart rate enough to burn fat for fuel. The focus is on quality of movements rather than quantity. T-Tapp doesn’t require routine changes to remain effective. T-Tapp works long-term because your body never fully adapts to the workout the way it does with traditional exercise routines. 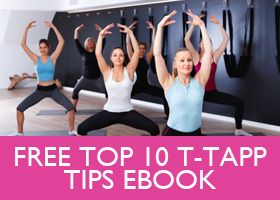 The stronger you become physically, the greater impact each T-Tapp workout has for you. I know it’s hard to really get a grip on what this workout really does. I’ve done a lot of videos sharing this method of movement. Love to have you check them out on my Youtube Channel. Let me customize your own T-Tapp workout to give you the best results possible. Call me at 678-522-8056 or Contact Me here. Want to start with one of the beginning DVD”s? Click here to decide which DVD best suits your needs!